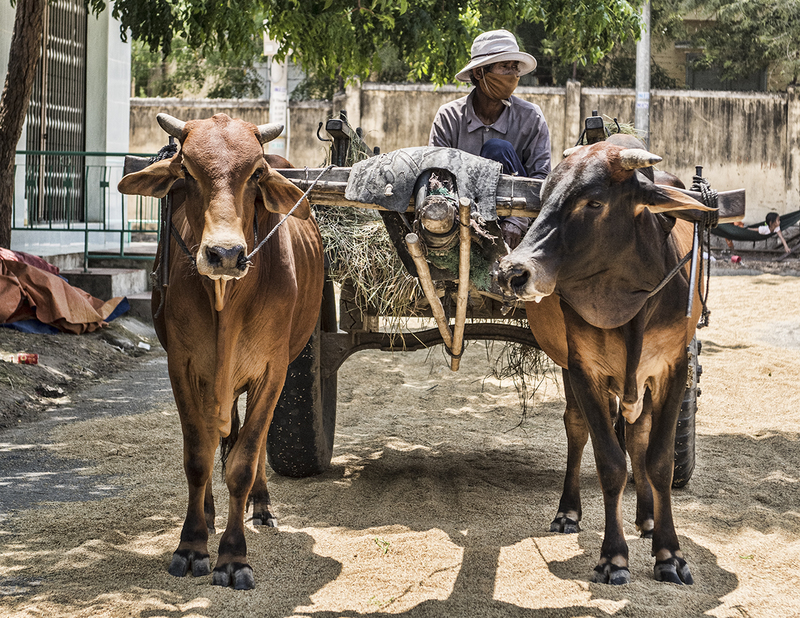 Oxen with driver in the Ninh Thuan district of Viet Nam. My last blog post ended with us wrapping up our visit in Bau Truc. I wish I would have had the ability to bring back more of the beautiful hand made figurines that were made in that household, but we weren’t able to carry too much while riding motorbikes. I did get my hands on a very nice little candle holder to take back to the US with me when my travels end. I really enjoyed my time watching the older woman and her daughter using their 12th century traditional methods brought back to life by this small village to create works of art. 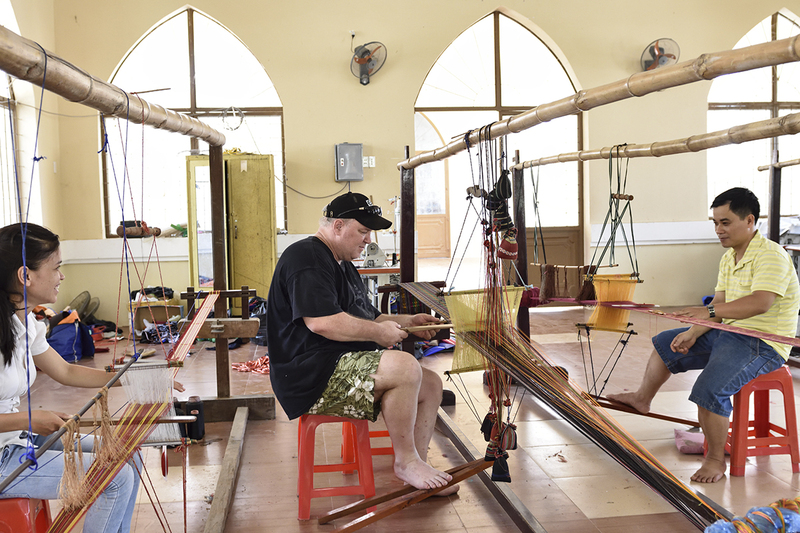 Now it was time to get on the bikes and head down the road to another traditional Vietnamese location where we would watch women weave clothes by hand with old fashioned looms. But, before we left this quiet little hamlet, Ha’s uncle and I turned a corner, and I caught the photo at the top of this blog, with the two oxen and their driver. If you look closely, you will see that all over the pavement of this tiny town, down every street, around every corner, rice still in the husk was laying out, drying. I felt as if I was living in another time, a simpler time, a time when life was a much slower pace. 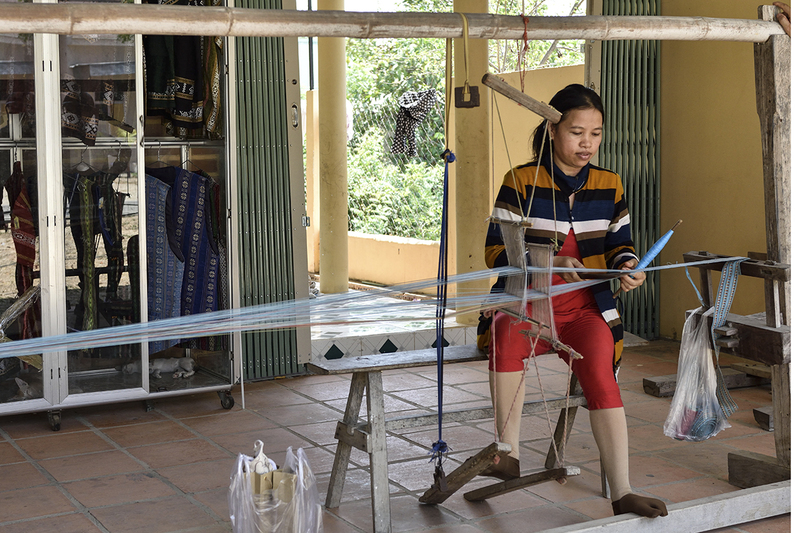 So now it was on to the My Nghiep village in the Ninh Phuoc district to watch the men and women of this area weave their brocade fabric into beautiful clothes, scarves, purses, bags, and backpacks. The village is famous all over south east Asia because of their designs, and is highly coveted in China, Thailand, France, and Malaysia. These artisans have won many awards due to their creative, beautiful patterns that they weave. We were very fortunate to be able to watch the woman in the photo hand weave a beautiful belt, and let us even try a little bit of hands on experience. People all over the village all work at this trade, and we were able to stop at several places and see different types of draw looms used in this process. With our feeble efforts to try to create our own fashion line of brocade clothing failing, we gave up and headed on to our next destination. Now it was time for some real serious business, wine! The road to Ba Moi’s vineyard is very picturesque as you wind along the Dinh River to his property. 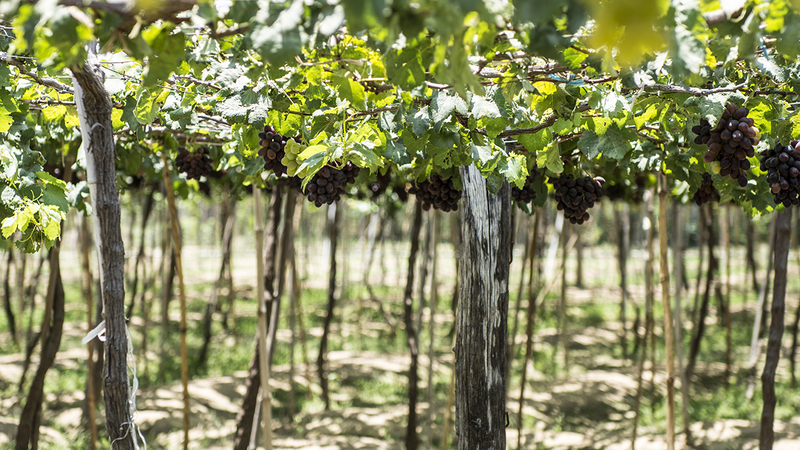 Uncle Moi has worked hard to bring better grapes to the region, and was one of the pioneers in Viet Nam for growing grapes organically. Ba Moi not only grows extremely succulent grapes, but also gives his guests a memorable experience. 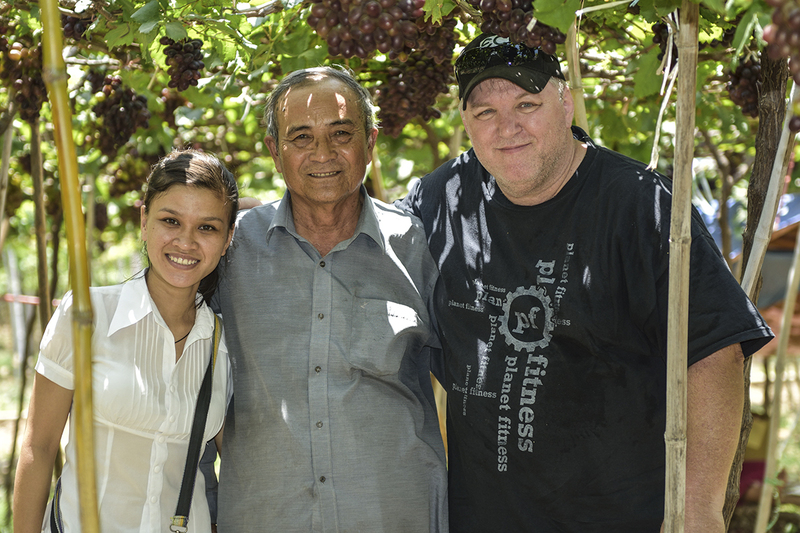 He is extremely friendly, and sat down with both Ha and myself, taking time to explain his growing process to us, and invited us to freely taste his different varieties of grapes. You can see by the way he treats his workers, and the smiles on their faces, that he is an extremely generous owner. 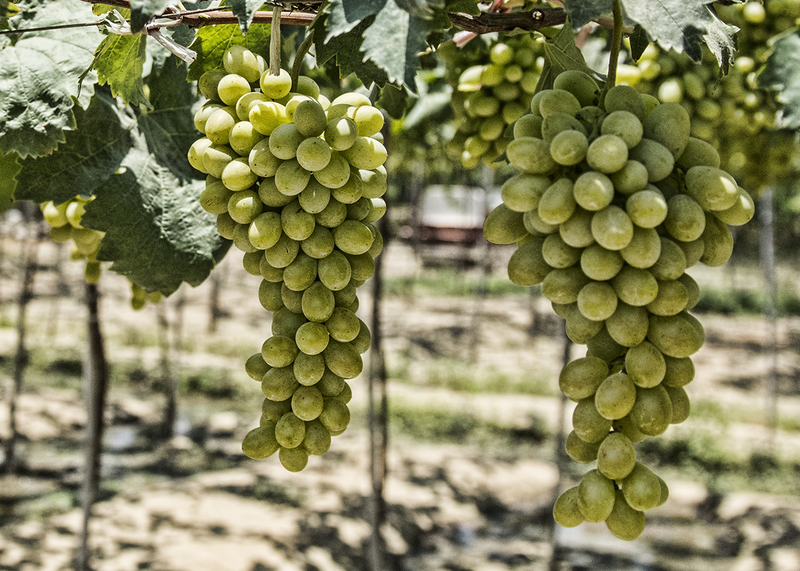 Not only were his ripe, seeded grapes unbelievably sweet, but the juice he produces from his fields was absolutely, positively the best tasting grape juice I had ever drank in my life! It has a unique sweet, yet slightly tart taste that was amazing. I am still considering his offer of trying to find a way to help him import and sell his juice in the United States, but that is something I won’t pursue until I’m living in Viet Nam. Fortunately for us, we were able to safely stash several bottles back to Phan Rang so we could drink them later on that night. Unfortunately we decided to pass on the wine…we have motorbikes to operate, so that will just have to happen on another occasion. I would highly recommend making the Ba Moi vineyard a destination stop when traveling to Ninh Thuan. Several of the major travel companies in Viet Nam also believe it is a must see location. Moi has decorated his property with a plethora of flowers, and along with the adjoining rice fields, the vineyard is a stunningly picturesque setting that gives one a remarkably serene feeling. We left, relaxed and our thirsts quenched, but our tummy’s were calling, so now it was time for lunch in a neighboring town. The four of us stopped in a quaint restaurant that hadn’t seen a foreigner in their place in as long as any of the staff could remember. After filling up on some delicious chicken there, we headed off for an evening ride on the bikes to a beautiful bay that will be the feature of my next post!